Boston Spa-based Deans Computer Services (DCS) has enhanced its Cloud technology portfolio with the introduction of Advanced Business Cloud Essentials, a fully integrated platform providing a wide range of business solutions. A launch event at the company’s head office showcased a range of functions including financials, customer relationship management, stock control, supplier and operations management, sales and opportunity management, payroll and dashboard reporting. Developed by Advanced, the UK’s third largest provider of business software and services, the platform is delivered as a Software-as-a-Service (SaaS) which is easily accessible through any web browser and enables a pricing model that allows businesses to scale their usage. DCS is offering the product as part of a network of resellers within the TruePartner programme supported by Advanced. It is now available as a stand-alone solution or alongside other systems provided by DCS, including the company’s own on-premise and Cloud back up, Amber Vault, and its comprehensive range of cyber security offerings. 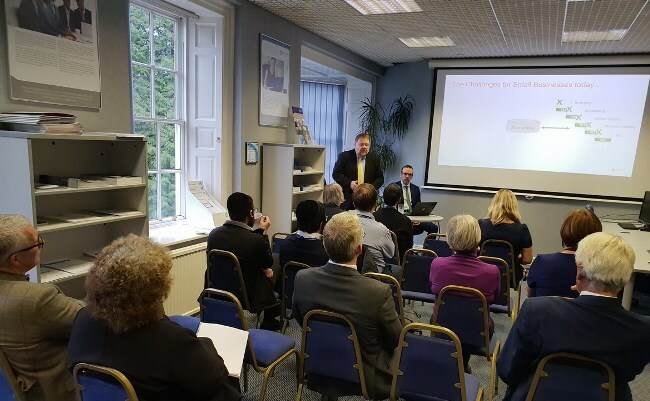 Patrick Clayton, managing director at DCS, said: “The team from Advanced attended our launch event to present a high-level overview to existing and prospective customers, followed by several one-to-one discussions. In the afternoon many of the attendees took the opportunity to get hands-on with the software and dig deeper into its functionality. We’re delighted to report lots of positive feedback for the software and for DCS.